Well we eat out quite often and on top of that I exercise regularly; sometimes I wonder is my body getting enough nutrients. Plus we are exposed to free radicals and pollution every day. Do you know that free radicals can destroy our healthy molecules and causes chain reaction of damage to various parts of our body cells. Nothing is more valuable than our health because when we lose our health our loved ones and family suffer with us too. So two months ago I was introduced to these supplements, pre and post workout shakes by USANA Malaysia. Actually I knew about USANA from my friend some time ago, she told me after she started taking USANA supplements she feels more energetic and her overall well-being improved. I can see her gradual improvements as well, that gives me an urge to try it too. USANA Health Sciences was founded in 1992 by Dr. Myron Wentz, PhD an internationally recognized microbiologist, immunologist, and pioneer in the development of human cell culture technology and infectious disease diagnoses. USANA Health Sciences is a state-of-the-art manufacturer of nutritional supplements, foods, and personal care products. Before I started taking any supplement I asked myself should I take nutritional supplements or not? Then I do some checking and understand that supplement does not replace our healthy diet, however proper supplements can bridge the gap between what our body needs in optimal nutrition, and what most of us actually get from food. Sometimes our body might not get sufficient nutrients to repair the damage cells. These are the supplements that started to take when I was training for my Tokyo Marathon 2017 back in February. I have Essentials, CoQuinone, Procosa, MyShake, Whey Protein Plus and Fibergy. The Essentials which consist of AO Pro Tablet and Chelated Mineral are my foundation or basic that we need daily. It provides necessary vitamins and minerals for to keep me going and also support my immune system. Proflavanol C combines antioxidant bioflavonoids from grape-seed extract with high potency Poly C to maintain our health and support our immune and cardiovascular systems. Our body lost anti-oxidant when we workout so we have to replenish it back and it also help to maintain our skin youthfulness. Procosa II delivers glucosamine HCL to help maintain healthy cartilage and joints. This is important for those 30 years old and above plus those who run regularly need to maintain our joints and bones as well. CoQuinone provides our body with highly absorbable coenzyme Q10. This is important for those who workout, runner or athletics because this vitamin generate energy needed to power our cells. For those who get tired easy I would suggest you take this supplement. This is so convenient to drink, just add a tablespoon in my water or juice every morning or after lunch. This is a delicious and convenient way to increase my fibre intake and maintain a healthy bowel system. I take MyShake and Whey Protein Plus together, there are two types of MyShake its available in Soy or Whey. I have MyShake as my breakfast before I go to work, I mixed it in my juice or make smoothies. It’s so delicious and healthy. Sometime when I am hungry instead of going out for teh tarik and roti canai I will make MyShake in the office. It’s fast, healthy and fulfilling too. MyShake Whey and Whey Protein Plus are great for my pre and post workout drink. Usually 1 hour before my training I mix 2 to 3 scoops of MyShake, add about 10 grams of Whey Protein Plus and add 400ml water in BlenderBottle, shake and drink it. I even bring it to Tokyo before my marathon I had MyShake with Whey Protein Plus is gives me the energy and sustainability to complete my marathon. For the supplements I take 1 tablet each per day and Fibergy Plus also I drink it once a day. MyShake I will drink it as and when I need it, usually is once a day but during my training days I drink 2 or 3 times day. Overall, after taking all these essential nutrition supplements from USANA I see the improvements in term of my body performance and also overall well-being. I don’t fall sick easily and also my energy level increased. When our body have enough nutrients it will perform better, it helps me in my training and also my marathon. first time know of this brand. Shall visit the website for more info. I don't take Usana but am taking another brand which also has these shakes and supplements. Yes, it is to bridge the gap of what I eat fresh and not get enough of. never heard of this brand before... i think i should start taking a type supplements as i'm getting older now.. huhu thanks for giving me an option. No wonder u look so beautiful.. I always find it hard to take supplements as the price isn't cheap. But good stuff are rarely affordable.. Or reasonable prices during promotion periods only. 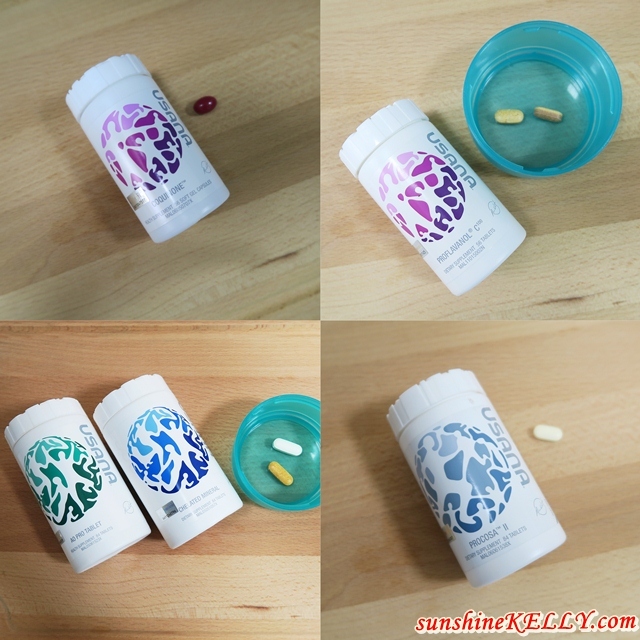 USANA is a good supplement and I take it before. But the price is expensive.